The cast and crew of Flicker at a rehearsal. 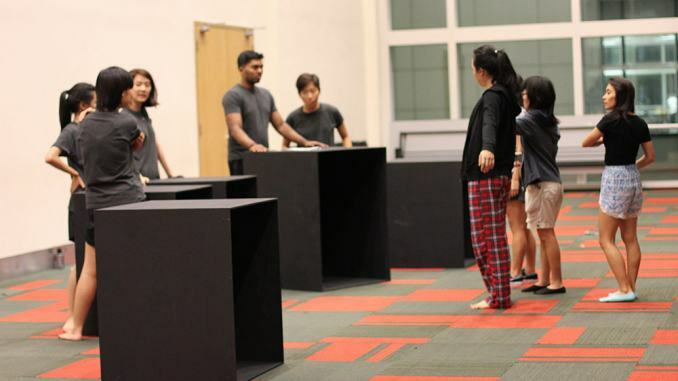 Hailing from Hwa Chong Institution’s graduating batch of 2014, Ang Kia Yee and Leong Xuan Li, both 19 this year, have gathered together a group of passionate individuals to form an up-and-coming youth theatre group, MAKESPACE. The name MAKESPACE was decided unanimously after much thought. According to Kia Yee, “Basically, the philosophy is that a lot of people generally close themselves up into spaces whether it’s literal or figurative—a label or a set path that you must follow. They will be having their inaugural production, Flicker, at the Substation on 17 and 18 July 2015. Starting from scratch was not an easy task for the group. They managed to get funding and grants from Matchbox, a local organisation that gives out funding to artistic upstarts. Still, they had to scrimp and save to rent venues for rehearsals. Nevertheless, they managed to round up a dedicated team of cast and crew. Despite budget and space constraints, MAKESPACE strives to produce quality work befitting professional theatre. In fact, what’s most admirable about them is precisely their determination and dedication to the art. Jai, a cast member, is a 28-year-old doctor working at Singapore General Hospital. He works in the day and rehearses at night, while trying to keep his energy up as best as possible. The duo see this as a permanent fixture. Regardless of what they may pursue in university, they still want to do theatre. However, they want it to be a fluid platform for the arts: “The reason why it’s MAKESPACE and not MAKESPACE Theatre or Productions is because I want it to be a general platform for the arts. My friend wanted to do some kind of film project so I was hoping that could be part of MAKESPACE,” says Kia Yee. “I want to see MAKESPACE more established in the future, and I hope that people know it as a group that produces quality work. At the moment, we’re still unsure about what the niche is, but hopefully we will find it…I also hope we will collaborate with other groups and experiment with other mediums,” Kia Yee adds. Their inaugural production, Flicker, tells stories of nine characters and explores different themes. Its complexity and intricacy leaves even the scriptwriter, Kia Yee, struggling to define the play. Ultimately, the play celebrates humanity and the fact that each one of us is idiosyncratic. The two believe quality theatre must send across a message. “Good art, to me, has to be meaningful. Good theatre has to convey a message, and every element has to be there for a purpose,” says Xuan Li. “Also, good art is something that is quite subjective… If I see someone dancing badly on the street but it’s meaningful to me, then I suppose that’s good art to me,” Kia Yee adds. Good art, to me, has to be meaningful. Good theatre has to convey a message, and every element has to be there for a purpose. One of Flicker’s influences is Cake Theatrical’s Decimal Points 810, a play about a man hallucinating. Cake Theatrical Productions is one of Kia Yee’s favourite theatre groups, for its whimsical and disjointed style, making their plays “incredibly fun to watch”. For Xuan Li, she enjoys works from The Theatre Practice, a Chinese theatre group founded by Kuo Pao Kun, for its meaningful plays that convey rich social messages. Stylistically, Kia Yee attributes the offbeat nature of the play to her experience in Nanyang Girls’ High School’s Theatre Club, where she was influenced by the abstract style of their plays. Both Kia Yee and Xuan Li applaud the fact that there are more groups emerging. However, Kia Yee thinks that youth theatre groups should not be too hasty to start; instead, they should take some time to learn from existing groups first, such as interning to learn the ropes.